“We’ve had a difficult time finding ways to predict who will develop severe scoliosis, and these newly identified mutations have the potential to be very helpful,” said senior author Christina A. Gurnett, MD, PhD. The findings appear online in Human Molecular Genetics. Drugs currently in clinical trials block a major growth pathway that these mutated genes, fibrillin-1 and fibrillin-2, control. If the same pathway is involved in scoliosis, doctors might be able to use these drugs to prevent scoliosis in some children with these mutations. One to 3 percent of the general population has some mild curvature of the spine. In about one in 10,000 children, scoliosis will produce curvature so pronounced that it requires corrective surgery. In 91 patients with acute scoliosis, the scientists sequenced the portions of the patients’ DNA that encode proteins. The most consistently mutated gene in the group was fibrillin-1, which makes a protein important to the tissues that connect many components of the body. A related gene, fibrillin-2, also often was mutated. Additional sequencing of those genes in 852 patients with scoliosis and 669 subjects with healthy spines revealed that patients with specific mutations in both fibrillin-1 and fibrillin-2 had four times the risk of severe scoliosis than people without the genetic errors. The researchers used a new cost-effective method they developed that reduced the cost of sequencing each patient’s genes to about $30 from $3,000-4,000. To date, scientists have identified more than 600 mutations in fibrillin-1. Among the most serious are the mutations that produce Marfan syndrome, a condition that can cause the long bones of the body to overgrow and can weaken the body’s connective tissue. Clinical trials are underway in patients with Marfan syndrome to see whether drugs that block TGF-beta, a growth pathway controlled by fibrillin-1, can help treat the disorder. Gurnett and her colleagues are watching to see if the drugs affect growth of the spine. If they do, researchers may investigate using them to prevent scoliosis. The researchers continue to look for additional genetic risk factors. “We’re very confident that genetic studies are going to open up new avenues for diagnosis and treatment of scoliosis,” said coauthor Matthew Dobbs, MD, professor of orthopaedic surgery, who treats patients at St. Louis Children’s Hospital and Shriners Hospital. This work was supported by Shriners Hospital for Children (85200-STL), the Children’s Discovery Institute of Washington University and St. Louis Children’s Hospital, the National Institutes of Health (NIH) (K12 HD001459-08, K08NS075094, R01AG044546) and the Alzheimer’s Association (NIRG-11-200110). Buchan JG, Alvarado DM, Haller GE, Cruchaga C, Harms MB, Zhang T, Willing MC, Grange DK, Braverman AC, Miller NH, Cheng JC-Y, Dobbs MB, Gurnett CA. 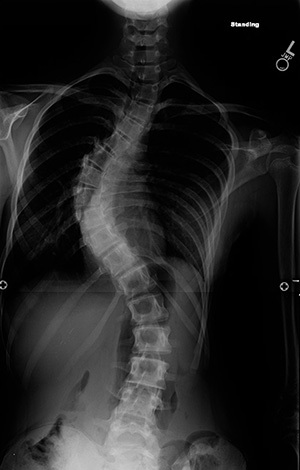 Rare variants in FBN1 and FBN2 are associated with severe adolescent idiopathic scoliosis. Human Molecular Genetics, May 29, 2014.